Goddamn life is good. 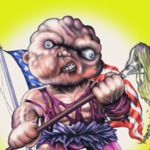 Bout time you announced some good GPK news Jeff. Next, I don’t want to hear from you until you announce Cheap Toys Series 3. Lets make 2019 a special year in GPK! You gonna buy any of these Sgorbian slimes, Russ? How many cases? Just one, only because they are the 2013 painted ones that Topps counldnt sell. If they are some that were made in weird colors I would personally fly to Italy open every case I could find, throw away the slime and ship the figures back to my house and fly home. Ha ha, that would be an awesome trip! I would have to tag along and document it. Just when you think you're out, they drag you back. I hope they do this again, but with new sculpts. I wish, but I kind of doubt it--at least not from the Italian side. Slime and other squishy manipulable goos/foams are big in Italy now. I've been collecting Skifidol for years now and the trend has been towards laziness and brand dilution over the past year. And why couldn’t Minkins have been packaged this way here? I was excited for about 2 second when I saw these and then realized what the figures actually were(Minikins) but good for somebody doing something semi new. Interesting that they plastic wrapped the figures. I wonder if these may have been inspired by Uranus packaging his customs in slime filled containers? Would be interested in one for the collection, but not a whole set. Although they're not NEW figures, I'd take re-released Minikins every damn time over GPK socks, notepads, beer koozies, ear plugs, dog toys, and every other little gift shop GPK licensed junk. Now who do we got in Italy that can hook us up? The Slime has arrived on the east coast. Hey I'll take 2... pretty please.